Burans performing live at cafe wall street on 23th January at 7:30 pm onwards. Burans is a band based in the capital city Delhi. Burans play Sufi Rock Music. They have an urge to spread love all across through their music. The band is solely devoted to Sufi and rock music, trying to cut across communities, castes and economic diversities with it. They create an ambiance filled with peace and harmony with their music. 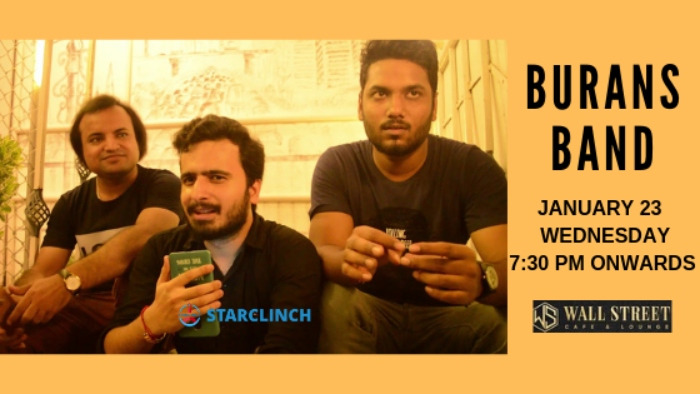 Burans is a band of 4: Rohan is the vocalist and keyboard player of the band, Shubham plays the bass guitar, Rahul Saxena is the lead guitarist and Rahul Rawat plays the drums. Churning out soothing and beautiful melodies, their music is a delight to hear. They have done a number of shows at cafes and restaurants and they also have composed covers and unplugged versions of a few popular sufi songs.